After cleaning out my art room I found these wine bags I had purchased to paint and sell for a local business. This one is soft but fibrous. The others are burlap. They are interesting to paint on! Here’s one on burlap. Its a two bottle wine bag. 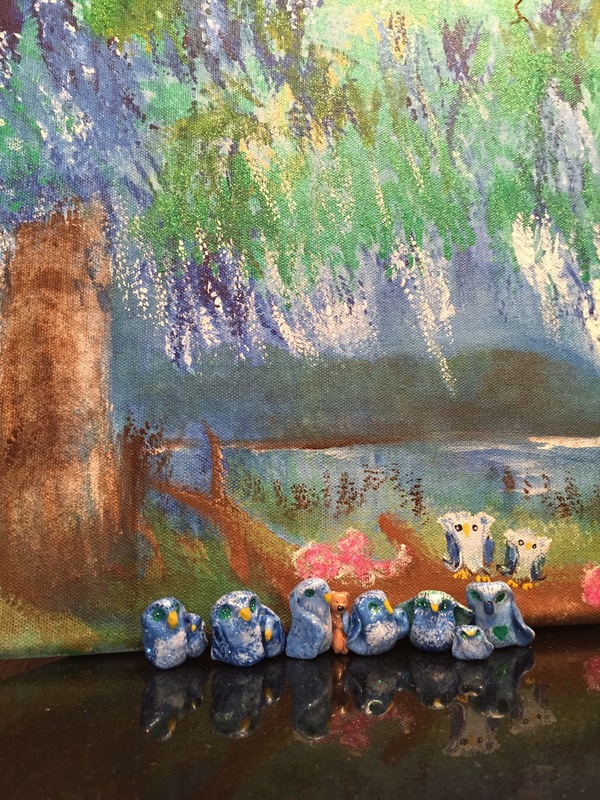 I sold some but stopped painting them to pursue other things at the time (like any good artist… :). I’m going to paint them all and set up an Etsy shop to sell. So far I’ve painted ten bags. After I get a few more I will get the shop set up. Oh and here’s one on a paper wine bag. Pushing a stalled car where the driver is attempting to start it is dangerous because its possible to get run over. But, in my past before I ever heard about that, I helped push a friend’s stalled older car that needed a momentum to get going. That gets me thinking, do we need a push when our motivation gets stalled out? Both words have a common meaning. Motor and motivation: “to move”. The former must have an external fuel source or push. The latter can come from another such as a motivational speaker. But the best motivation comes from within. Sometimes an outside push helps but sometimes it just isn’t there. For instance I haven’t been able to find one person who is willing (as yet) to do the giving up sweets challenge with me. I thought for sure someone would be intrigued and give it a good try at least. I thought that I might have needed that kind of a push to keep going. To be sure, there have been countless times in my life where I have needed to be the only one driving my success and pushing it! – like mastering a course or skill, beginning a new job, having a baby. Maybe it’s helpful that no one else is doing the sweets challenge with me yet. Maybe it is better to solely depend on a continual conscious effort of heart and mind and internal drive. That way I am depending on God. A “Navy Brat”, I spent my childhood at the beach. I think it’s why I’m magnetically drawn to paint it now. I race through cleaning up the breakfast mess and make sure my husband has plenty of coffee and “reading” material because I’ve got an ocean scene calling my artist’s imagination. Have I mentioned I’ve painted stacks of paintings, many of them ocean scenes. Not all good. Some ok. All still in a learning stage for me. As I paint, my husband and I usually chat about what he’s looking at in the paper. He thinks he knows the people in the pictures, he’s been in business with them, his mind is delusionally entertwined with them. Mostly I say “Oh, is that right,” and “Wow I didn’t know that”, faking a tone to allow him to continue there. I know he just likes the talking and the time. I put a live ocean scene on YouTube loud enough so I can feel like I’m there and so I can study the light hitting all the places light hits, glowing, refracting, being deflected and diffused, causing shadows. only in my mind through the power of TV. As all of this “excitement” is raging, my husband gets up to return to his second love, Turner Classic Movies. First he looks at my painting and says, as always, “Another ocean”. I try not to be deflated by the flat dementia tone that I know he has entirely no control over. And he leaves me at my painting to go watch Turner Classic Movies. I’m painting and my husband is reading the paper. He can still read. He will read out loud to me as I am painting which is good for me. I have gotten so used to his dementia. Only, with his dementia, he has no ability to know what he is reading. But he reads with feeling as I am in the middle of painting this imagined pathway that I have worked on off and on for awhile. He has asked about five times what we are doing today. I just say, well, I’m painting and you are reading the paper. He’s ok with that. We have our morning rhythm. Then, I walk down this pathway as I often do in my paintings. I love the experience of doing that and wonder if other artists do that too or am I just getting a little “teched”. While I am “in” the painting, I decide there have to be shadows along the white dusty road but I do like how it is reflecting the light from the after storm clouds and the clouds are wanting some smoothing. I love the feel and look in the just after the storm passed time. I want to put that feeling here. 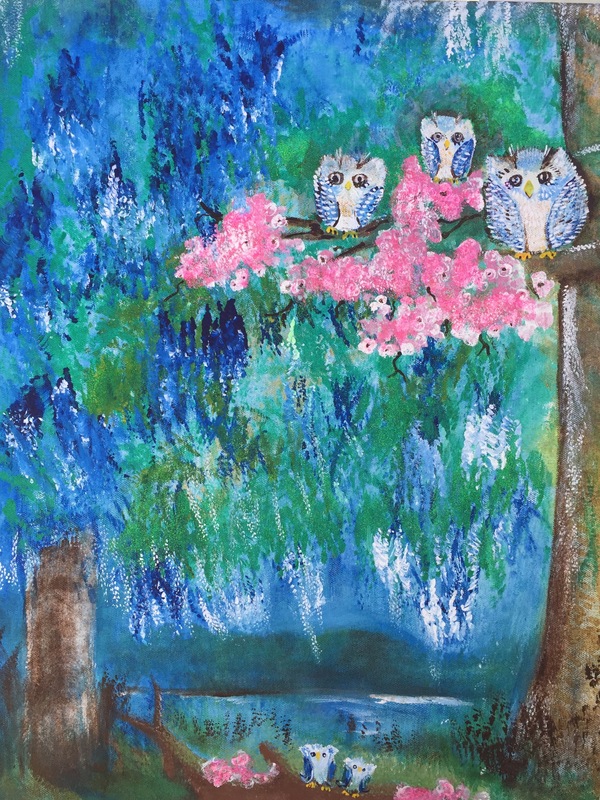 I was given this high need to paint not too long after my husband was diagnosed with frontotemporal dementia. The desire to paint was a gift just at the right time which I know was sent by God. The painting of beach scenes and pathways soothes me and right now I don’t really care about selling them yet. I’m looking to make my paintings right in my own estimation. I will be making my Patreon account public that I have been working on creating. I’ve been working on it each day. Patreon is a place for artists who share their art with patrons who support that artist. I intend to provide videos of myself painting and talking about my life and my painting process. 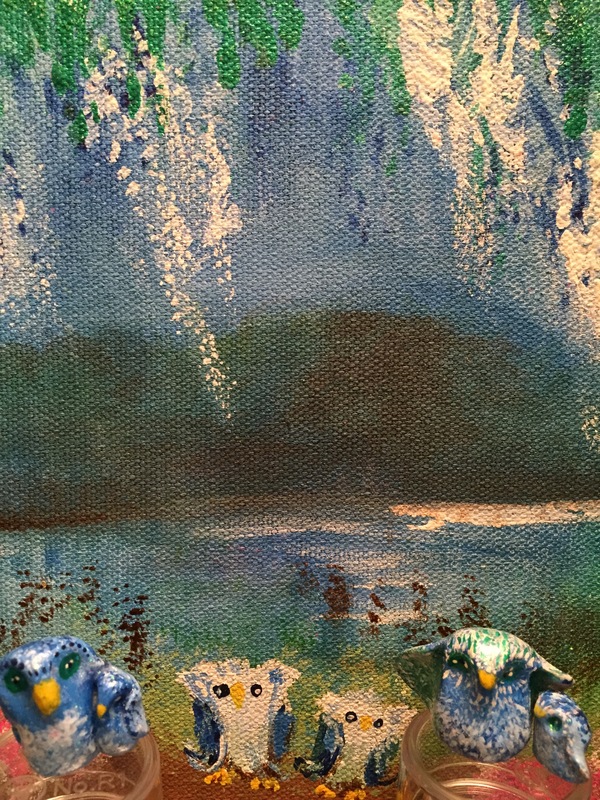 And, eventually I plan to provide prints of my paintings for my patrons who support me. Right now, I’m trying to figure out how to do a good video. I want the videos to be artistic and enjoyable to watch. After I snapped the above picture of my painting before I added additional rocks and let the water spill over the front right rock formation. I often will put water in my paintings as if it has just collected in a place after a big storm has passed over. It is a peaceful feeling with sweetness in the air. And, my husband folds up his paper, puts on his Bluetooth earphones, and says, “Now I exit stage left”. Today’s paintings… I tried to get loose with my strokes. I love peonies. They are the most delicate and luxurious flower. I have tried and failed to paint them many times but just recently I was asked to paint them by a special person in my life so I studied them and am making a go of it. here are the studies i am making of these beauties. I am painting with acrylics using thalo green, alizarin crimson, cadmium yellow medium and titanium white. I have used a little mars black in the background as well. 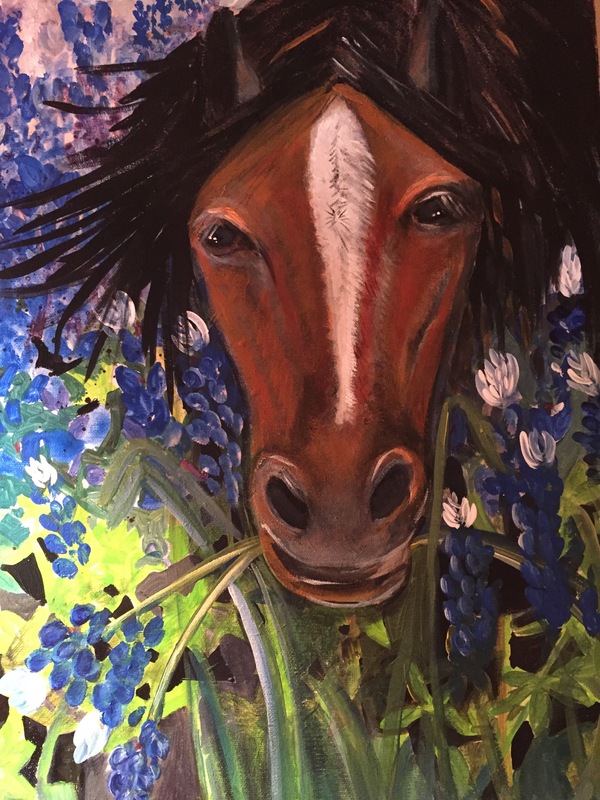 Taking a break from pastels … Acrylic horse bringing bluebonnets. I have ordered some nice new pastels and i have decided to wait before doing anything more with the cheap ones. So in the meantime i pulled out my acrylics. The horse is bringing a mouthful of Texas bluebonnets.